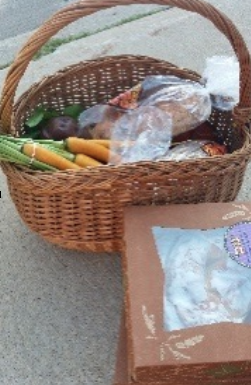 Posted on Sep 1, 2015 by Appleton Downtown Inc.
My first stop was at the ‘Produce with Purpose Farm’ stand. 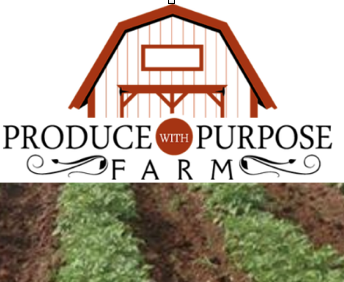 Rick Slager and his wife, Dawn, own ‘Produce with Purpose Farm’, located five miles east of Fond du Lac. It is a four season farm and 51 weeks out of the year they are selling their produce. “We love diversity. We believe that not all carrots are orange and potatoes brown. We love to educate people on the value of eating healthy and encouraging youth (and adults) to find out more about where there food comes from!” Ask Rick a question about any of his vegetables and he’ll be more than happy to share. His enthusiasm for farming is infectious. The produce is displayed so beautifully, you’ll have a hard time trying to decide what to purchase! Displayed here are all the beautiful vegetables I used to create a dinner for friends. 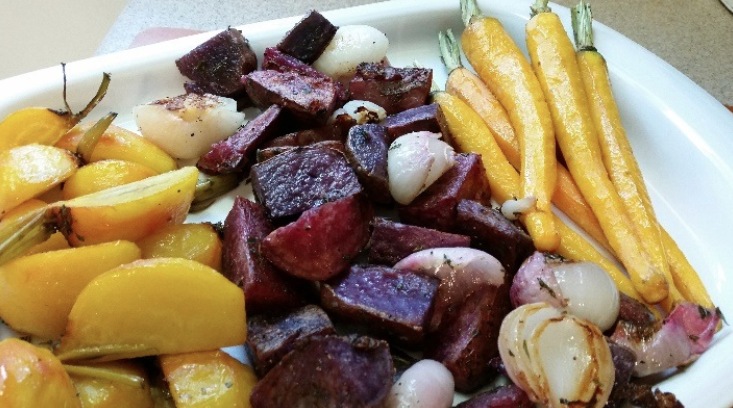 I especially loved the deep rich colors of the purple potatoes, the orange Sherbet carrots, the yellow beets and the purple mini sweet onions. I did a simple roasting of the vegetables with olive oil and a sprinkle of salt and pepper. 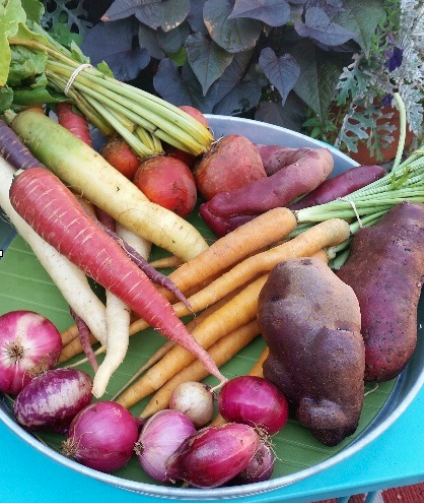 The beets and carrots were almost like having a dessert! The sweetness of the flavor was amazing, as were the purple onions. 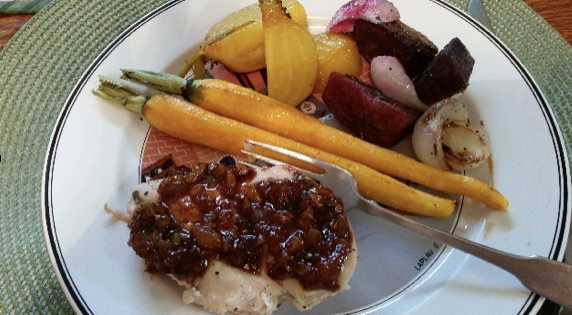 I paired the vegetables with a simple roasted chicken breast topped with an apricot chutney. It was a delightful evening with friends and I so enjoyed sharing my experience at Produce with Purpose Farm. The stand is located towards the end of College and Drew. Please give Rick a visit. He will be happy to see you!